If you are applying for MS Molecular Biology program at any university then you need to write a personal statement for graduate school of that university along with other required documents such as a transcript of the record, application form, recommendation letters, and application fee if any. The sample of personal statement for graduate school given below is written by me and you can use it as a reference to construct your own personal statement for graduate school. Molecular Biology deals with the study of biology and biological phenomenon on a molecular level. The most important thing in living things is the proteins which mostly involved in nearly all biological processes of the living beings from structural level to then functional level. Although proteins are most functional and regulatory Biomolecules, they are regulated through the information contained within the genetic material like DNA. 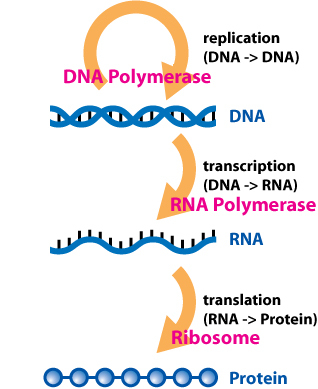 Proteins are expressed through the messenger RNA from DNA to Protein. Such process is called the central dogma of the biology. Though cell appears to be very simple, but the every biological event occurring inside a living cell are more complex and are highly coordinated. All the Biomolecules are in sequentially and coordinately performing their function in such a way that the cell can survive by self-replication and division. During the past centuries, there has been no significant development in the field of molecular biology here in Nepal and therefore here is a scarcity of molecular biology experts. But now, here in Nepal a little growth can be seen regarding molecular biology development, beside I want to put myself as a molecular biology expert to do something good for my country. As Nepal is a developing country and, therefore, needs to be developed through the invention and discoveries in the different field of life sciences and, therefore, I want to be one of them. I had a great interest in science in my childhood school and always enjoyed the biology part of the science. My science teacher always appreciated my work and motivated me, due to which I decided to join Science program in higher secondary level to deepen my knowledge of basic sciences including biology, physics, and chemistry. When I moved to the higher secondary school in 2004 I got the chance to be exposed to more depth of basic sciences. During my higher secondary school, I found chemistry and biology much more interesting, how the living thing remain alive though they are composed of non-living innate materials. Obviously there are interesting things; coordinated and systematic occurrences of different biochemical reactions within the cellular environment give innate Biomolecules to a life. All these interesting factors inspired me to go further more depth in biological life science and, therefore, I joined Bachelor of Science in Biochemistry. Undergraduate studies of the biochemistry program led me exposed to different parts of biochemistry, including molecular biology, cell biology, physical biochemistry, Biomolecules etc. in molecular biology I studied different properties of nucleic acids like DNA, RNA. How different types of information are contained in the double-stranded DNA molecules which are made up of simple phosphates, deoxy-ribo sugars, and some purine and pyrimidines base pair codons. And how these simple constituents are composed in such a way that a thousand of base pair codons are able to form the condensed structure of chromosome which occupy a small portion of the cell called as a nucleus. Molecular Biology, the study of life on molecular level really can give a way to treat some diseases that are inherited from parents to offspring (known as genetic diseases), because molecular biology makes us understand the actual cause of such disease up to the molecular level and once the cause is known there will be no problem with the development of treatment for such health diseases. Hemophilia which occurs due to mutational change in the position of the amino acid at position 6th of a β chain, the hemoglobin 3-dimensional structure becomes changes and result in the destruction of erythrocytes. There are possibilities of treatment for such problems on the molecular level, if we can replace the defective part of the gene that encodes the misplaced amino acid then this disease can be cured. Such treatment is called Gene therapy. Such treatment can only be possible with the understanding of the molecular-level study of life. I, therefore, want to be exposed myself in such a depth knowledge of molecular biology so that I can push myself toward molecular biology research and I can do independent research in molecular biology. Here in Nepal scope of molecular biology must be created to some extent, so that peoples like me can get a chance to know much more knowledge regarding molecular biology. Hence, with all these regards, I prepared myself as a versatile and capable individual. I believe what I learned from these research experiences with my academic background will contribute to my future academic success. An opportunity to be enrolled in the graduate program at this prestigious university enriched with excellent faculty and well-equipped lab will allow me to stretch academically with the necessary skills and experiences to achieve my career goal of becoming a proficient research scientist. I am excited at the possibility of joining the program at this prestigious university and furthering my research objectives. This is the personal statement for graduate school i wrote for my application for MS Molecular Biology about 2 years ago. Hope this will help you construct your own personal statement for graduate school for MS Molecular Biology program.